Abstain from placing anything in the mouth for fifteen (15) minutes prior to beginning the test. This includes non-alcoholic drinks, tobacco products, coffee, breath mints, food, etc. Open the foil package and remove the test strip. Observe the reactive pad on the end of the test strip. The pad should be a light cream color. 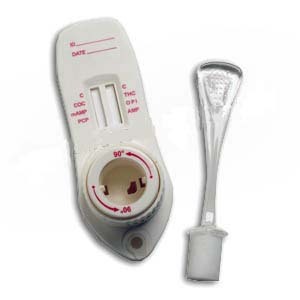 A test strip with a reagent pad which is dark tan in color or otherwise discolored must be discarded. Saturate the reactive pad with saliva from mouth or sputum cup. Immediately start timer. At two (2) minutes observe the color change (if any) in the reactive pad. A color change of green or blue indicates the presence of alcohol and a positive result. Results obtained after more than 2 minutes and 30 seconds may be erroneous. Estimate the approximate blood alcohol concentration by comparing the color of the reagent pad with the color chart appearing on the test package. 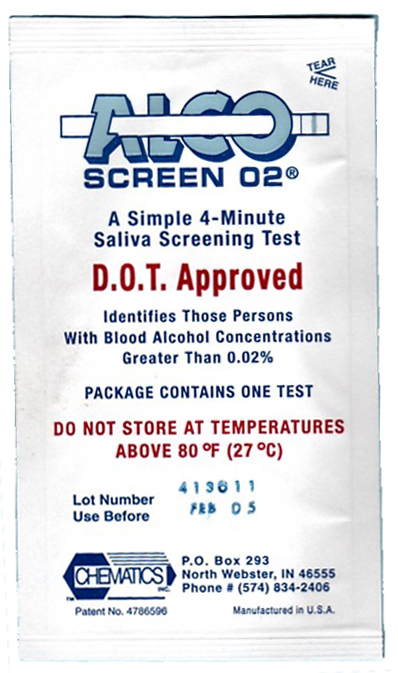 ALCO-SCREEN produces a color change in the presence of saliva alcohol ranging from a light green-gray color at 0.02% blood alcohol concentration to a dark blue-gray color near 0.30% blood alcohol concentration. Color blocks are provided within this range to allow an approximation of blood alcohol concentration to be made. ALCO-SCREEN may produce colors that appear to be between adjacent color blocks. 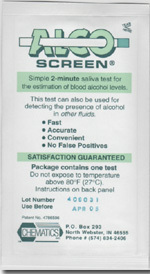 ALCO-SCREEN is very sensitive to the presence of alcohol. A green color that is lighter than the 0.02% color block should be interpreted as being positive to the presence of alcohol in saliva but less than 0.02% blood alcohol. A result where the reagent pad shows no color change (remains white or cream colored) should be interpreted as a negative result (no alcohol present). A result where the outer edges of the reagent pad produces a slight color but the majority of the pad remains colorless should be repeated to ensure complete saturation of the reagent pad with saliva. If the second result is the same, the results should be interpreted as being negative (no alcohol present).